Optical Art often termed "Op Art" has its roots from the Bauhaus school borrowing from constructivism. Op Art is often geometrical art that plays tricks on the eyes. It has quite a profound effect on the eyes and is sometimes hard to look at for a period of time. This is because of the intense and excessive stimulation to the eyes and brain. Once dismissed as simply optical illusions, it is now understood that Op Art uses complex color theory and line principals. Op art is done in black and white only and also using certain color combinations because of their relationship to one another produces a certain effect on the eye. These color relationships are simultaneous contrast, successive contrast, and reverse contrast (or assimilation). Using certain color relationships will create the optical illusions such as movement, gyration, hidden images and juxtaposition. You will often hear someone say "That makes me dizzy" when they look at Op Art. It indeed does make one dizzy! However, it is an extremely unique and interesting form of art. 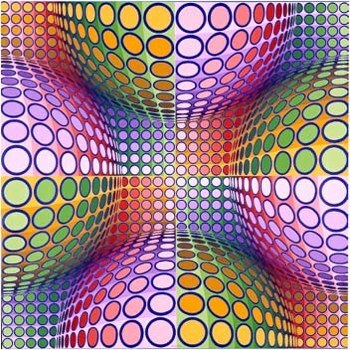 An import an Op artist from history is Victor Vasarely (1908-1997). He is considered to have created the first Op Art piece. Op Art medium is mainly paintings and digital art vs. photo graphic art due to the difficulty in finding effective subject material. However difficult, it is not impossible as demonstrated by the artist Laszlo Moholy-Nagy (1895-1946). He was an educator at the Bauhaus who gave lessons to his students that had then cutting holes in their works and then photographing them. I remember sitting in the doctor's office once with my son and we were exploring a book that had a hidden picture in it. We sort of had to cross our eyes to see the hidden picture that would seem to be imprinted within the very colorful geometric type art. The book was called "The Magic Eye". The art in the book is called stereogram and seems to have been inspired by Op Art.